Real Housewives Of Atlanta star Phaedra Parks is getting her share of drama … but it’s of the courtroom variety. That doesn’t always translate well to reality TV’s ever-present cameras, especially when one of the parties is behind bars. But legal drama is always a treat to follow. Even if we don’t know how much of this can make it onto the small screen. Apollo Nida and Phaedra have a prenup, but we can get to that in a moment because that is its own thing. So, just a few days before the couple got married back in 2009, Apollo and Phaedra signed a prenup. Apparently, in addition to an agreement on how to divide their shared property, the prenup specified that neither of them would receive alimony in the event of a divorce. We don’t have the luxury of looking over their detailed financial histories, but it stands to reason that, when they got married, Apollo was confident that he’d be the one paying alimony if the two of them ever split. The guy’s in prison for money fraud, so he probably believed all sorts of things about wealth. As it turns out, crime doesn’t always pay. Who knew? Well, now TMZ reports that Apollo Nida wants his and Phaedra’s prenup voided. Because of course he does. It sounds like Apollo legal troubles — to put it mildly — have adversely impacted his finances, and like he’s hoping to be supported by his ex, Phaedra. 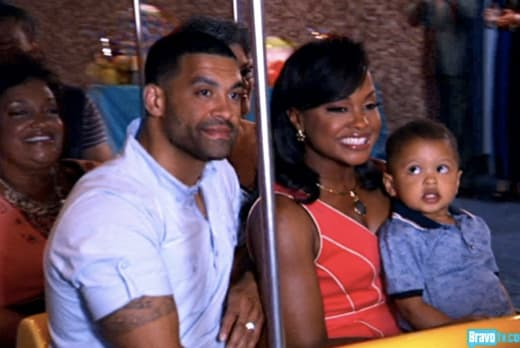 It wasn’t long at all after their marriage that Phaedra was cast on RHOA, and that must have turned their financial situation on its head in the best way. Except, of course, Phaedra’s not interested. Just because she became the breadwinner while his life collapsed doesn’t mean that she owes him a thing, and she wants the prenup upheld. We have to talk about prenups themselves, though. Sometimes they’re a great idea — to prevent, like, nightmare universe versions of Cinderella from marrying rich and then filing for divorce in a quick grab for half of somebody’s assets. They’re usually assumed to be legal tools to “protect” husbands from manipulative femme fatales, but that’s because men are generally valued by their success while women are in so many cases still valued by their looks. But it looks like those sexist stereotypes and how they must have influenced his own assumptions are coming back to bite Apollo Nida in the you-know-where, because Phaedra’s the one rolling in dough. There’s no sure way to know how this case is going to end — there’s some extra drama around Phaedra spelling Apollo’s name wrong on the prenup, so for the first time ever, your kindergarten teacher’s insistence that correct spelling matters is actually sounding kinda real. But it seems to us that a prenup is a binding contract. Unless it was made under duress or false pretenses, and it doesn’t sound like either of those were the case, shouldn’t it be every bit as ironclad as Phaedra believes it to be? Legal cases can surprise you, though. We may never know the whole story with this messy pair of exes. Maybe if Apollo had spent less time on money fraud and more time working on his relationship with his wife, he wouldn’t need a court battle to enjoy some of her wealth. Lady Gaga Halftime Show: The Edge of Glory… and GIFs! Next story The Bachelorette: Will First Impression Rose Win Streak Continue!? Previous story Jennifer Garner: Still In Love With Ben Affleck? !